This is a very basic yet essential recipe in any mexican cook’s repertoire. 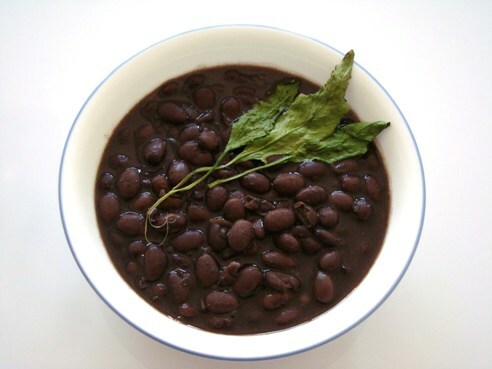 It’s the base for many other recipes, such as refried beans or bean broth. Instructions: Rinse the beans, taking care to get rid of any pebbles or dirt that you might find. Tip the beans into a large casserole and cover with the boiling water. Next, with the heat on medium high, add the shortening and onion, let boil. Once it starts to boil, reduce heat to low and let simmer, covered (for about 4 hours for pinto beans, maybe 3 for other varieties) or until they are barely soft and the skin starts to break. Add the salt to taste (and the epazote if using black beans) and cook for another 30 mins. Note: the broth is used in many recipes, so you might actually want to keep it too!